The Bridlewood West Subdivision is in the Tucson’s West area. It is west of I-10 and east of the Saguaro National Park – West. Home prices will range from under $150,000 to over $1 Million in this area. Many homes will have large lots and horse properties are common. There is a wide range of home choices available in the Bridlewood West Subdivision and Northeast area. Some will offer an urban feel while others seem rural. Families living in Bridlewood West Subdivision are served by the Marana School District. 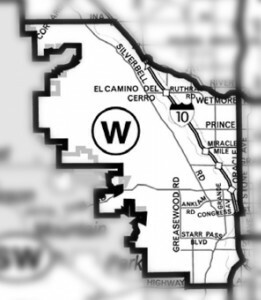 The Bridlewood West is in the West Area of Tucson, AZ. Shopping, restaurants, and activities can be a bit of a drive depending on the specific subdivision you live in. Restaurants to visit if you live in the Bridlewood West Subdivision or another West area location are La Olla Mexican Cafe and Cattlemans Cafe. Many homes will have fantastic views of the Catalina Mountain and Tucson City lights. The Sonora Desert Museum and Old Tucson Studios are landmarks in the west area. Are you thinking of buying a home in the Bridlewood West Subdivision or another area of Tucson? Finding the right home can be a challenging process. But we can make the process much less stressful for you.